Review Zentyal 2 is something a little bit different, although it too has changed its name recently: version 1 was called e-Box. A decade younger than its rivals, it is based on Ubuntu, but its developers skip the normal semi-annual releases, and only use the Long Term Support ones that Canonical releases every other year. E-Box version 1 was based on Ubuntu 8.04 and version 2, now called Zentyal, uses Ubuntu 10.04.1. 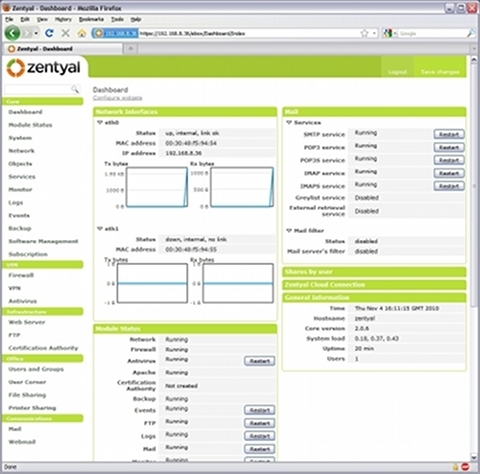 Zentyal is a server variant of Ubuntu, so it is a rather different experience from its CentOS-based rivals. The boot sequence of both the install CD and the finished system is the standard Ubuntu graphical one; even Zentyal's logo is recognisably similar to Ubuntu's. The installer is the old Ubuntu text-mode installer and only takes some 10 minutes to create a running system. There are no customisable options at all during the installation, apart from entering a name for the system's single user, the administrator. Like Ubuntu, Zentyal eschews the use of the "root" account, so the first user created is the server admin – meaning that you might want to use something generic like "system administrator" rather than your own name. Unfortunately, Zentyal, like ClearOS, doesn't support software RAID out of the box – indeed, the installer only used the first drive in our twin-drive test server, leaving the second one entirely empty. The installer does configure Logical Volume Management automatically, though, so adding in extra space is straightforward and does not require a reboot or repartitioning. You get a small ext2-format /boot partition plus a large extended partition containing a single LVM volume, formatted to ext4, which is a sensible basic config and rather more modern than either of the CentOS-based offerings. After a very quick installation process, the machine boots straight into the login screen for a cut-down graphical desktop based around LXDE, a quite new super-slimline desktop from China which is also the basis of the new Lubuntu lightweight remix of Ubuntu. The Firefox web browser automatically opens and displays the login screen of the web-management dashboard. Everything is done through the browser and the LXDE setup contains little else – shortcuts for normal and root terminals and that's about it.